Even though they are often considered pests because of the voracious way they munch on vegetation, caterpillars are also marveled at for their strange, worm-like qualities. The dramatic transition of a caterpillar into a butterfly or moth is also a frequent metaphor for rebirth and renewal. Whether you are trying to identify a lime green caterpillar or are looking for one for artistic inspiration, several types of caterpillars, among the thousands of species, have astonishing green hues. 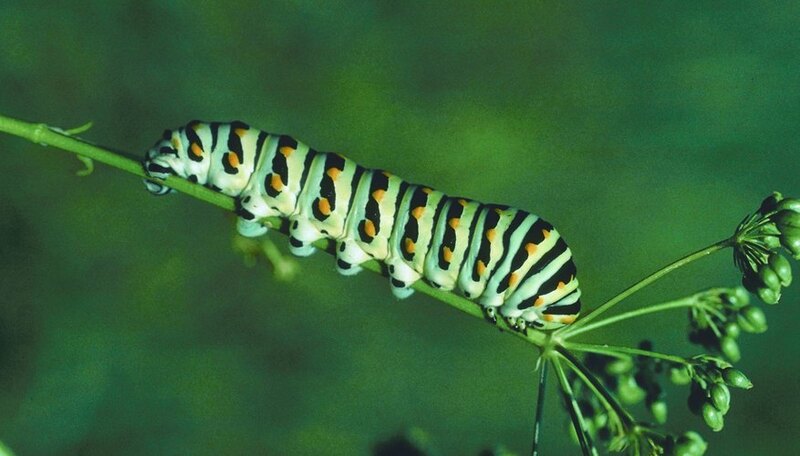 There are several species of caterpillars that are green in color. The caterpillar stage of the Polyphemus and Luna moths molt several times and are green for at least one stage. Tawny and Hackberry Emperor caterpillars are smaller and not as bright; these grow into brown, yellow and orange butterflies. Hatched as bright yellow caterpillars, the Polyphemus moth caterpillar turns bright green after its final molting. They grow up to 4 inches long and also have silver spots along their bodies. Polyphemus moth caterpillars hatch at the commencement of spring and towards the close of summer. They grow into a fairly large moth with a wing span of up to 5 1/2 inches. They are found throughout North America. The Luna moth has a black head and a bright lime-green body with a series of red dots. Like the Polyphemus moth, the Luna moth is of the saturniid family. Saturniids molt five times as larva. Luna moth caterpillars are typically green throughout. They are commonly found in eastern Canada, the eastern United States and parts of northern Mexico. The caterpillars grow up to 2 3/4 inches long and transition into moths with a wing span of up to 4 1/2 inches. Host trees for Luna moth caterpillars include maple, beech, birch, oak and citrus trees. The Tawny and Hackberry Emperor caterpillars are very similar. While they also are bright green, they are a bit less neon than the Luna and Polyphemus moth caterpillars. These caterpillars are also smaller, growing only up to about 1 1/2 inches long. They have brown heads and prominent antler-like protrusions. They both grow into butterflies that are typically brown, yellow and orange in color. 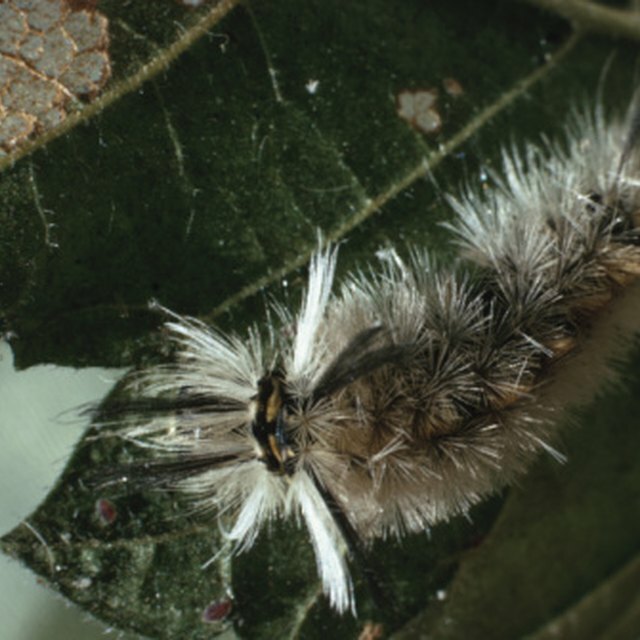 Both types of caterpillars use the hackberry tree, a type of elm, as their host, and are commonly found in eastern Canada, the eastern United States, some parts of the midwestern and southwestern United States and some parts of northeastern Mexico. Howard, Mason. "Types of Lime Green Caterpillars." Sciencing, https://sciencing.com/types-lime-green-caterpillars-6620670.html. 13 April 2018.